Dr. Jordi Monés gave the keynote speech last Saturday at the Sports Myths and Future Outlook Forum, which was organised by the Guanghua School of Management (Peking). Acting in his role as FC Barcelona board member and FCB Universitas Commissioner, Dr. Monés also signed on behalf of the club an agreement the footballing institution described as «highly strategic and a pioneer for collaboration in the development of the sports industry, both in China and in the world». The agreement provides for the creation of a Centre for Sports Industry Knowledge and Innovation (PKU-GSM FC Barcelona Sports Management Center) that develops joint activities with regard to knowledge and sports management models. With this centre, an important innovation hub will be created in Asia. 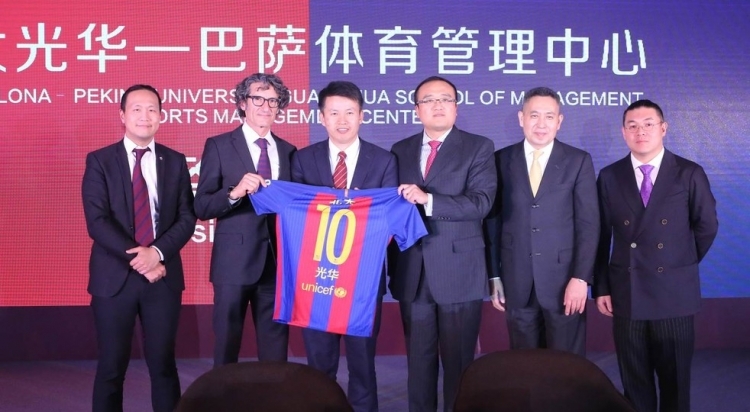 Dr. Monés said that FCB Universitas will bring to the Sport Management Center «all the experience and knowledge that FC Barcelona has accumulated over the years in areas like performance, methodology or sports management, while the Guanghua School of Management will contribute through its experience and the Chinese innovation model».